Mosaic of the Mona Lisa built from motherboard components. Thanks Darin, you know me too well. 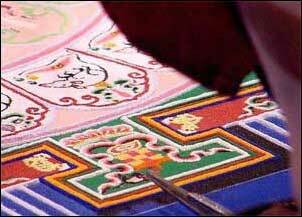 I saw a link to this series of photographs, depicting a group of monks working on a sand mandala, on the Kircher Society blog last week. While I’m not a huge fan of monks or sand-painting, I am a fan of large-scale, glacially-paced art projects and behind-the-scenes documentation. Clearly, the fusion of the two via stop-motion animation is among my favorite things ever (see here). These photographs were practically SCREAMING to be turned into an animation of some sort, so I felt it was my duty to download them and whip up a stop-motion animated gif. Here it is (2.8 Megs, takes a while to load). Shortly after doing this, I found that the creation of a strikingly similar Mandala had been animated here. This one is available as a quicktime movie, and features significantly more frames, at a significantly lower resolution. Compromises! Shortly after finding that video, I found another one, from Rutgers University. This one is the best of the bunch – lots of frames AND lots of resolution (wmv here). Skip about ten minutes in to get to the construction. If you just CAN’T get enough Monk-made-mandala action, here are some nice detail photos of yet another mandala-in-progress. Out of the groove – The state of independant record stores in Detroit. We’ve lost three in the last few months, and Neptune will apparently be next to close it’s doors. Hidden Gags in Looney Tunes and Merrie Melodies. More Comic Book Urban Legends. Alter-ego of Superman creator Jerry Siegel’s ‘The Spectre:’ Jim Corrigan. Ah ha! Weezer on MTV’s ‘Alternative Nation,’ circa the blue album. I was disappointed when this didn’t make the official DVD, but youtube has come to the rescue. Kennedy’s interactions with Rivers are priceless.